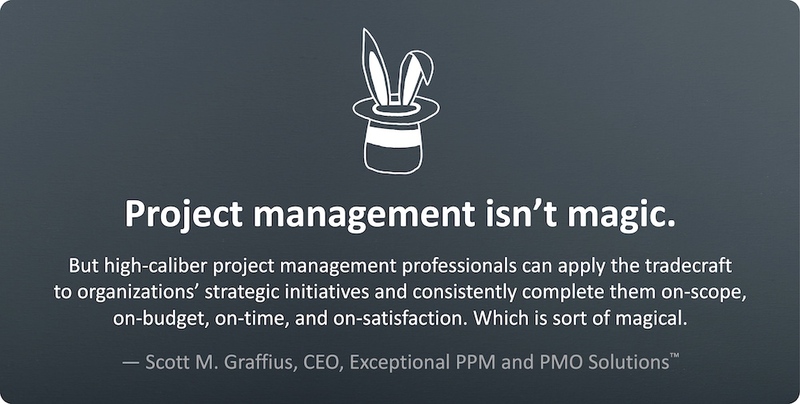 "Project management isn’t magic. But high-caliber project management professionals can apply the tradecraft to organizations’ strategic initiatives and consistently complete them on-scope, on-budget, on-time, and on-satisfaction. Which is sort of magical." Exceptional PPM and PMO Solutions™ is a professional services firm. We partner with client companies to help them achieve their strategic objectives and business initiatives through project management leadership. We provide project, program, portfolio, and PMO management services inclusive of agile, traditional, and hybrid approaches to development and delivery. 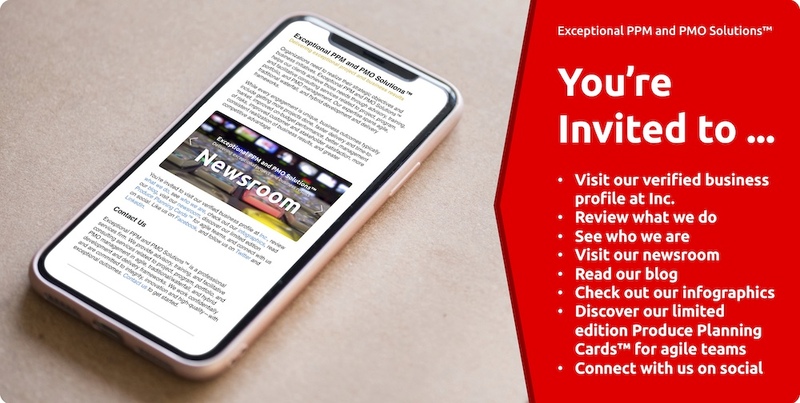 Business results include upgraded responsiveness to business needs, faster delivery and time-to-market, improved on-budget performance, higher customer and stakeholder satisfaction, and greater competitive advantage. Agile Has a Long and Colorful Heritage: A Timeline Infographic. Dashboard Indicators for Effective Visualization of Project Status. Metrics for the Successful Management and Control of Projects in the Traditional Development Framework. Project Portfolio Management Project Scoring Tool. Project Roadmaps for Executives and Other Stakeholders. Realizing Higher Project Performance Through Project Management Maturity. Reversing Troubled Projects: Overview with Top Actions for Recovery. SaaS and On-Premises Models and Project Management Solutions.